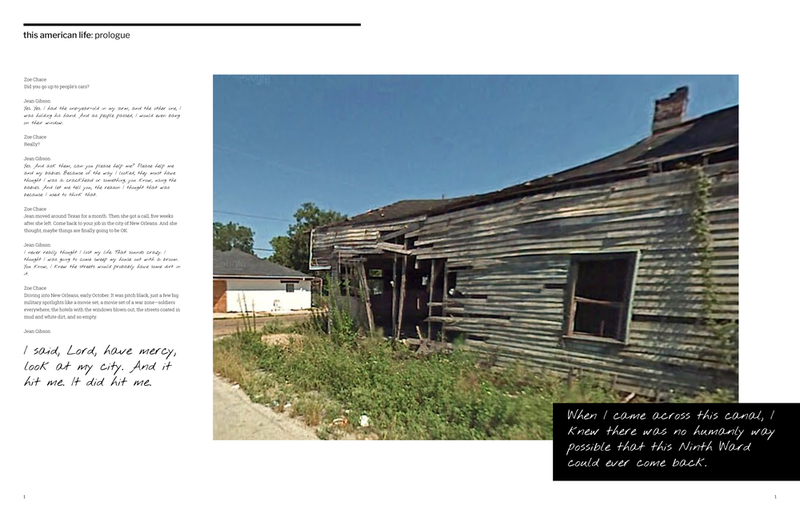 For this studio project, I designed and crafted a book about how the media framed the lives of Hurricane Katrina survivors in a negative light. The story examines how racial tensions and the misleading media influence stunted the efforts to rebuild what was left of New Orleans. I became interested in researching this topic after listening to a podcast episode by This American Life, marking the tenth anniversary of Hurricane Katrina. The episode, titled "Lower 9 + 10", takes listeners on a walking tour through the Lower Ninth Ward, the area hit hardest by the storm in New Orleans. The reporters meet different people along the way who share stories about losing their loved ones and prized possessions in the storm. Every day has been a real struggle for them as they slowly piece their lives back together. This process has not been easy for them as they have faced quite a bit of backlash over the years from the government for trying to rebuild the neighborhood. The people in power had abandoned the survivors in their critical time of need. In the aftermath, they were left to look for resources on their own. They felt neglected by the government and started to wonder if what they were experiencing was an act of racism and classicism. Did the government choose to ignore their call for help because the affected population was predominantly black? Politicians and celebrities on the Internet got involved in these heated controversial debates about race and politics, adding fuel to the fire. Katrina became a man-made media disaster overnight. News reporters shined a spotlight on New Orleans, spinning stories about the survivors that weren't always all that truthful. 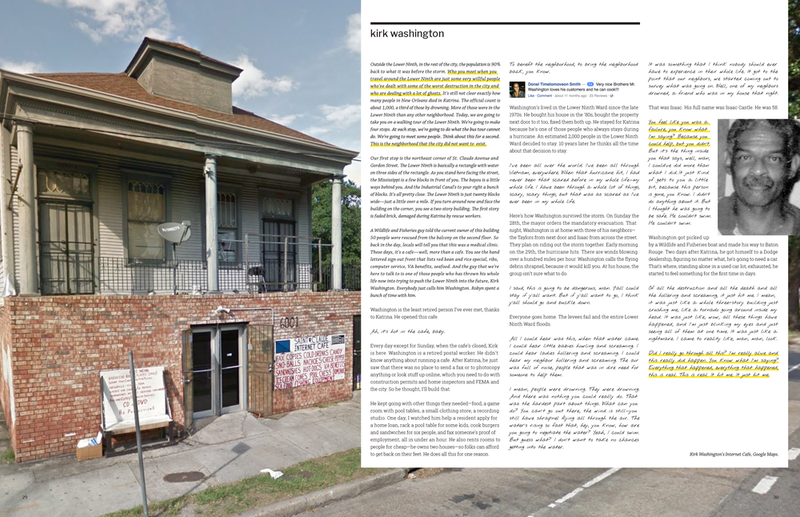 Newspaper article highlights how reports about Katrina's victims were exaggerated. Reporters exaggerated the situation often, painting the people to be criminals, drug-addicts and rapists. This made it difficult for outsiders to feel empathetic towards the survivors who were struggling to piece their lives back together. This narrative explores how racial tensions and media influence stunted the efforts to rebuild what was left of New Orleans. Even though Hurricane Katrina happened over a decade ago, the survivors still feel like they are walking around a ghost-town. 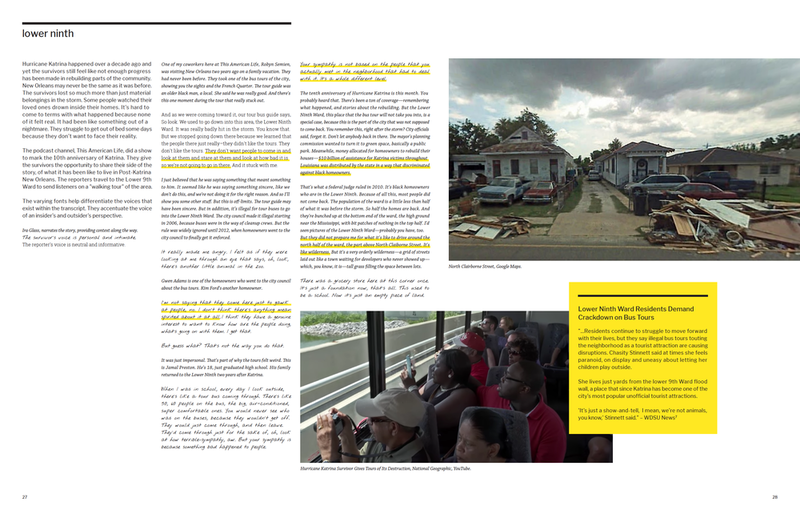 The Lower Ninth Ward has not fully recovered from the damage done by Katrina. A decade later, there are still plenty of abandoned homes, people living on the streets, and places covered in debris. Why haven't they been able to restore the neighborhood given how long it's been? What happened to promised aid and support? Survivors think that not enough attention has been paid to them and the restoration efforts. They accuse the government of neglecting them once again, just as they did when Katrina plowed through New Orleans. Mayor Nagin of New Orleans pleading for immediate aid and attention. This was my first time designing an entire book from beginning to end. I enjoyed getting the opportunity to contribute my own research and original writing to the project. I gained and refined many skills in the process. learned a great deal about composition, navigation, typographic hierarchy, tone, use of imagery and color. 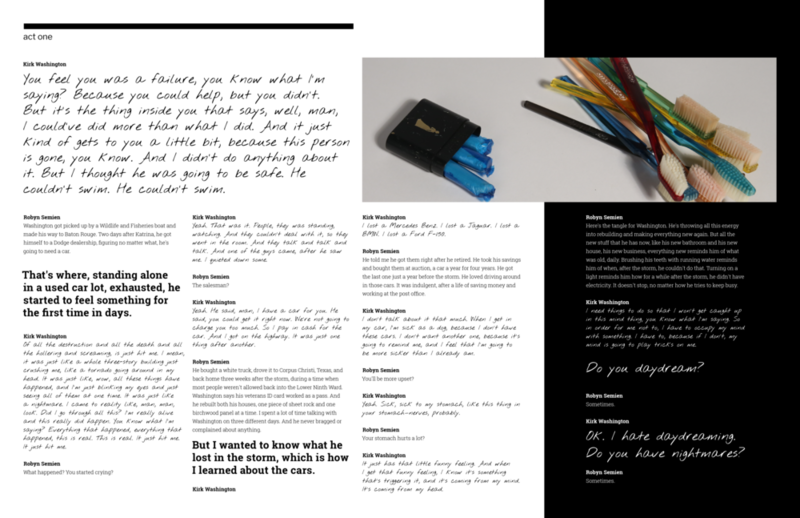 These are early iterations of what my spreads looked like before further refining them. At first, I struggled to treat the text in a way that gave it the right kind of emotion and tone. It was hard to find the right balance of text and image on a page. Eventually, I found a system that worked across the pages. The first part of the story weaves together contrasting opinions taken from the media, news articles, found images, and more. Then, the second half documents four excerpts from the transcript of the podcast. These stories, from real survivors, help support the earlier arguments described in the book. They share narratives about loss, destruction and discrimination. 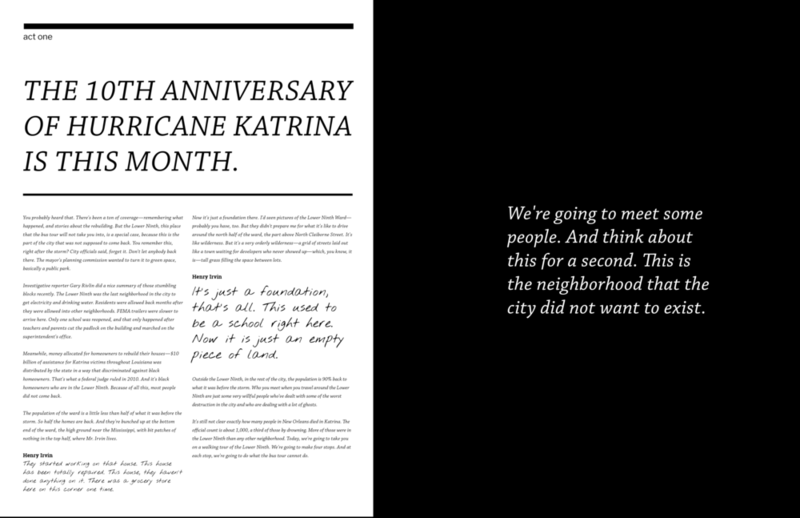 These survivors talk about how the damage done by Katrina still affects their daily lives. To this day, they mourn their losses. The spreads below highlight different aspects of the system I created. Some pages were meant to focus on the media while others honed in on the narrative and transcript. Feel free to view the entire book in PDF form online. If you'd like to check out more process, take a look at my Medium post.